The SAAB B17 was first designed as a reconnaissance aircraft but was mainly used as a dive-bomber. The Bofors Company at Trollhattan formed in 1937 Svenska Aeroplan Aktiebogalet (SAAB). Following its merger in 1939 with the AB Svenska Jarnvagsverkstadernas Aeroplanavdelning (AJSA), SAAB developed and built the SAAB 17 dive-bomber. In 1940, the Swedish Air Force ordered 322 aircraft that were delivered in the period December 1941 - 1944. Five versions were developed out of the basic SAAB B17, including the B 17A, a light bomber equipped with a 1065 hp Svenska Flygmotor 14-cylinder radial engine. The armament consisted of two fixed 8 mm machine-guns m/22 in the wings and a moveable 8 mm machine-gun at the observers place behind the pilot. A bomb-load of 500 kg could be carried. 132 SAAB B 17A were manufactured. SAAB B 17A 17239 was delivered to the Swedish Air Force (Svenska Flygvapnet) on 27 July 1943. It served with the 2nd Squadron of Wing F 7 at Satenas, coded ”blue Johan”. After it was retired as combat aircraft with the Swedish Air Force in 1948, it was used as target towing aircraft. However the 17239 was owned by the Swedish Air Force, the airplane used the civil registration SE-BYH. It was operated as a target tug by the civil target-towing company Svensk Flygtjänst until 1957 and by the Firma Avia from 1957 until it was retired on 30 June 1968. After being retired as a target-tug the SE-BYH was put in storage with the Swedish Air Force museum. In 1996-1997, the SAAB B 17A was restored to flying condition and painted and marked in the colours of 2nd Squadron of Wing F 7 at Satenas, code ”blue Johan”. 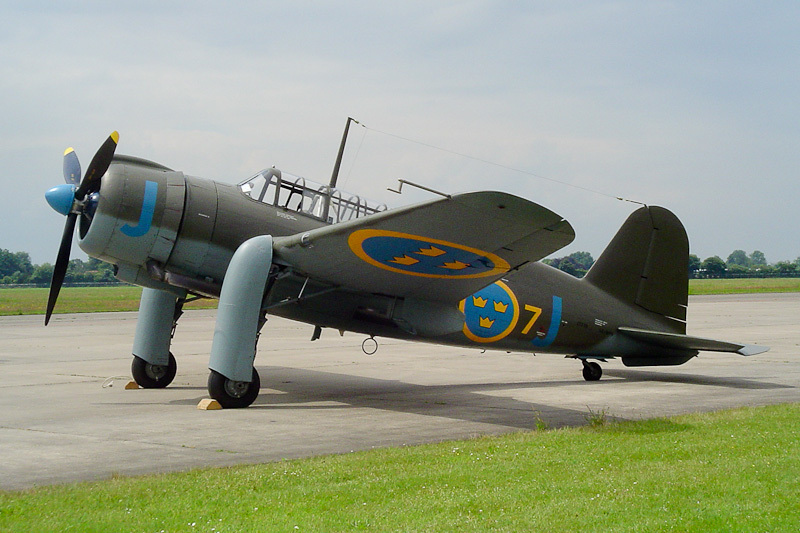 The SE-BYH is owned by the Swedish Air Force Museum. The SAAB B 17A was photographed at Groningen Airport Eelde in the Netherlands, when on route to Duxford in the UK.